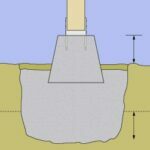 If local codes allow setting the overhead directly on an existing slab but the concrete is not thick enough to support the overhead’s weight, you will have to pour new footings around the slab’s perimeter or break out sections and pour deeper footings. 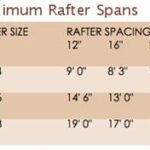 For information on installing a new patio, see Pouring a Concrete Slab. If you are building an overhead to cover an existing patio, you must first determine if local codes allow setting it directly on the slab and, if so, is the concrete thick enough to support the weight. Otherwise, you will have to create original footings for the overhead. 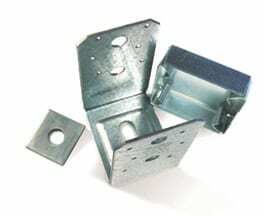 Post anchor is designed to be fastened to a concrete slab. In many areas, an overhead on a concrete slab is allowable if the slab is at least 3 1/2 inches thick and each post can support combined “live” and “dead” loads of up to 750 pounds (a ”live” load comes from stress exerted by wind, people, and the like; a “dead” load comes from the weight of the structure itself). To secure an overhead to an already-existing slab, you must place each post in a post anchor. Standard anchors work with rough and surfaced 4-by-4, 4-by-6, and 6-by-6 posts; any other size anchor will have to be specially ordered. To install a masonry anchor, use a drill with a masonry-bit attachment to make a hole large enough for a 1/2-inch expanding anchor bolt. After inserting the bolt, secure the post anchor by adding a washer and nut and tightening with a wrench. Cut the end of the post square, sit it in the base, predrill holes in the post, and then nail the anchor to the post. Another way to fasten the post anchor is by securing a short piece of threaded rod in a hole with epoxy cement. Start by drilling a hole slightly larger than the threaded rod. 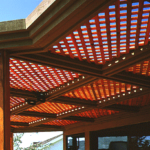 Check local building code to see if you can attach a patio roof directly to your deck. Blow out the dust, fill the hole with epoxy, and insert the rod to the required depth. Let the epoxy set (leaving it overnight will assure that it is rock solid), and then add the anchor bolt, anchor, washer, and nut and tighten. 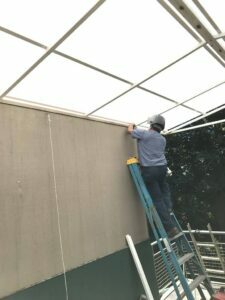 Where local building codes allow this practice, you can bolt a patio overhead’s posts directly to existing deck beams, joists, or other heavy structural members. Or, you can lag-screw through post bases and decking into the top of a deck joist or beam. 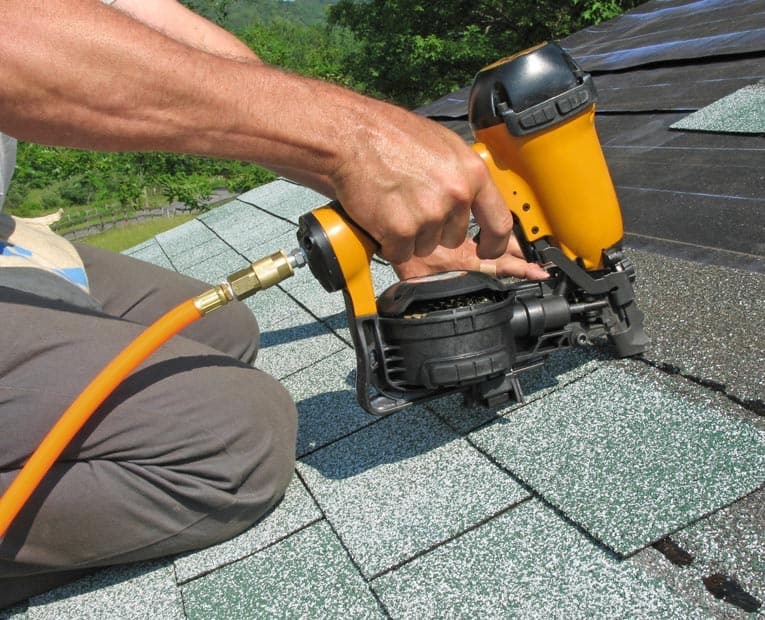 When bolting to the deck’s structure, be sure to use heavy-duty galvanized lag screws that are long enough to penetrate the deck’s framing by at least 2 inches. In some situations, you may be able to use the home’s structure to support an overhead above a deck. For a good example of this, see the article This Patio Roof Sheds Water, Allows Natural Light. This steel and polycarbonate overhead is entirely supported by house walls on both sides.